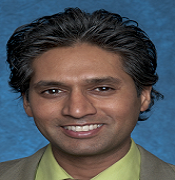 Dr. Tej Bhavsar practices medicine at the Queensbury and Saratoga Springs offices. He is accepting new patients. Dr. Bhavsar speaks English and Gujurati. Ayurvedic practitioner and a yoga instructor. Having previously publishing research in the field of radiation oncology, he is currently in the process of publishing innovative research in the practical field of knee arthrocentesis. In his spare time Dr. Bhavsar enjoys time with family, outdoor sports, playing music and gardening.